The Best Sports Car for the Money in 2017 is the Fiat 124 Spider, which replaces the 2016 Mazda MX-5 Miata for the honor. Mazda and Fiat jointly developed the two roadsters, and Mazda builds the 124 alongside the Miata. They share basic structural and chassis components, the top mechanism, and most of the interior as well, but have different styling and use different engines. The U.S. News & World Report Best Car for the Money award is determined by calculating which vehicle has the best combination of quality and value in its class. 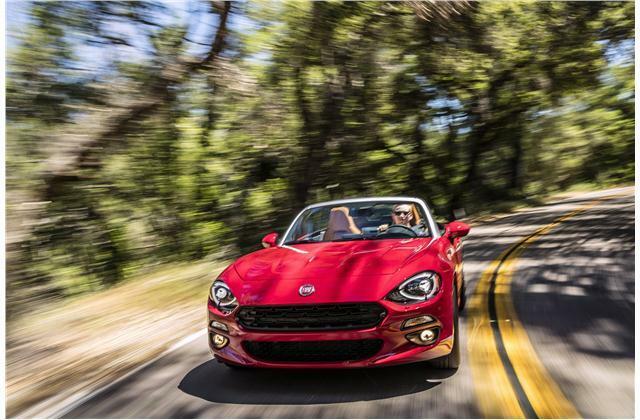 Read on to learn more about the Fiat 124 Spider. Reviewers praised the 124 Spider's turbocharged engine because it offers lots of torque for around-town acceleration, better than that found in the Mazda Miata. It also has nicer standard interior materials, and some reviewers also preferred its looks and slightly softer ride than the Miata, which is now our second rated sports car. Of course, reviewers' favorite feature of the 124 Spider is its convertible top. Not only does it let the sun shine in on beautiful days, but it is a cinch to throw over your shoulder when you get off the highway, or to pull back up at a stoplight if the rain starts drizzling or the sunburn starts to get too bad. Reviews also raved that the 124 Spider's consistently athletic handling moves whether you're tackling California's coastal Highway One or just navigating around your neighborhood. The Fiat's tiny turbocharged engine feels eager both around town and on the highway, though there is some turbo lag. It's easy to get the 124 Spider with all the latest technology, including Bluetooth connectivity and streaming audio, and a 7-inch touch screen with a control knob on the console, just like several high-end German convertibles. Read more on US News.